We have all been called together to honor the musical legacy of Broadway legend, wondrous tune smith Cy Coleman. To this end, Theatre A at 59E59 has been decked out as a club by set designer Douglas Schmidt and lighting designer Michael Gilliam. On stage: piano, three large red blooms in a vase (later put to dramatic use). Music stands and instruments await their players as the audience files in — string bass, drum set, trombone, saxophones tell us immediately that there will be some brass swinging this evening. This evening it is all about the music. Coleman’s name is not even mentioned — there is in fact no narrative throughline, no patter, no introduction of tunes — we have our outsized playbills for the bare facts of song titles and lyricists and performers. We aren’t told from which shows tunes are drawn to introduce a concept, to set a scene. This task is left to the individual performers to craft a world in which to experience the tunes, and they meet the challenge with varying degrees of success. Bandleader piano man Billy Stritch is positioned at a slightly submerged piano (it makes sense in the small performance space — and all the better for easing onto for the singers from time to time) to charm us, support the other performers, and occasionally croon himself, to great effect. The other singing men are not for me the strong points of this ensemble (Howard McGillin and David Burnham), though each has his moments with a tune or two. Burnham in particular finds something new and delightful with his spin on “I’ve Got Your Number”. The powerhouse trio of women anchors this production, fronts the image selected above for this review, and provides individual and solo moments to rock your musical-loving soul. Singing, dancing, movement, charm in abundance on the little stage. Rachel York and Sally Mayes duet stunningly on “What You Don’t Know About Women” and add Lillias White to perform a blow-the-roof-off-the-joint trio version of “You Can Always Count on Me” — both tunes from City of Angels. 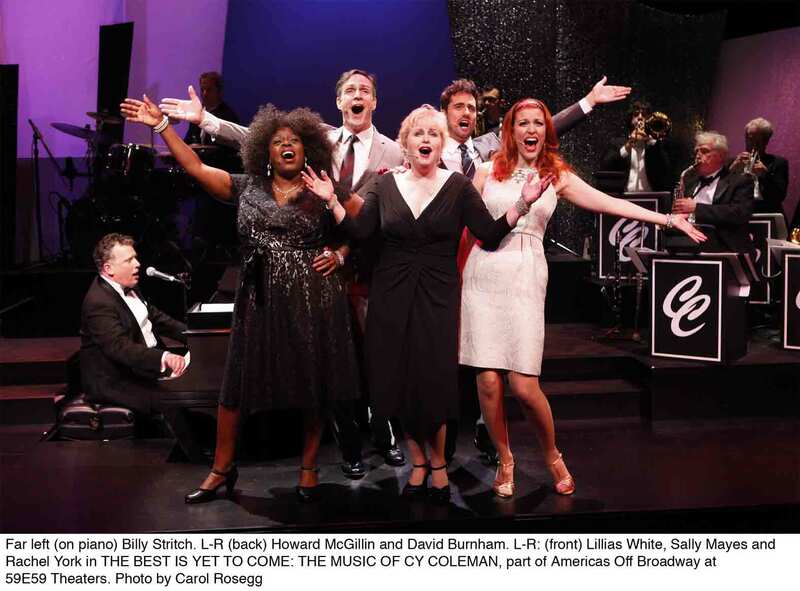 And then, in solo moments such as “The Oldest Profession” and in partnership with Stritch on “Little Me”, Lillias White simply transcends, supersedes, overwhelms the other talent on the stage. A book revue would bind together the song moments and bolster the clear talent each performer has in this ensemble. Without such supports, even more so than the other strong performers, Lillias White gives us a cabaret, sell-a-song, lifetime in a chorus, capture your heart and your mind kind of performance that is, indeed, gasp-worthy.